2 What do you want to know from Marlee? 4 What would it look like? 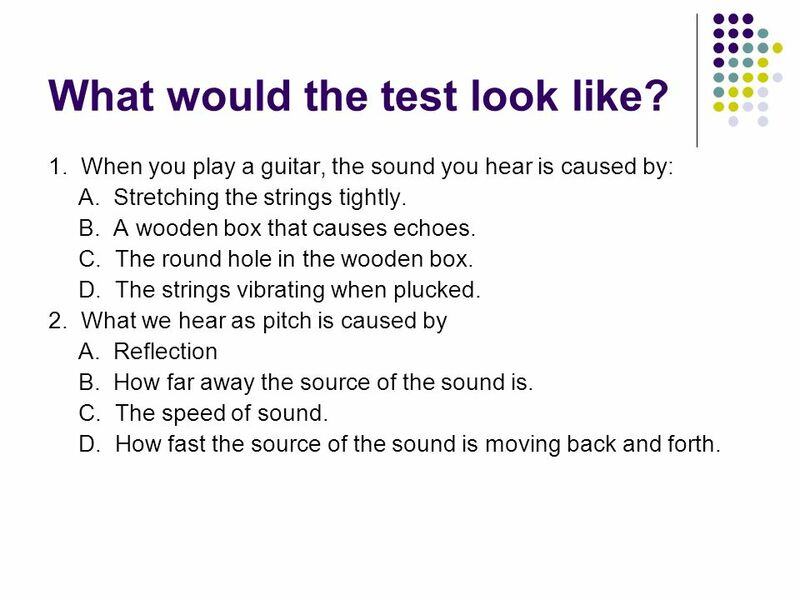 This is a sample of what a teacher could do to teach some of the physical science elements concerning sound. 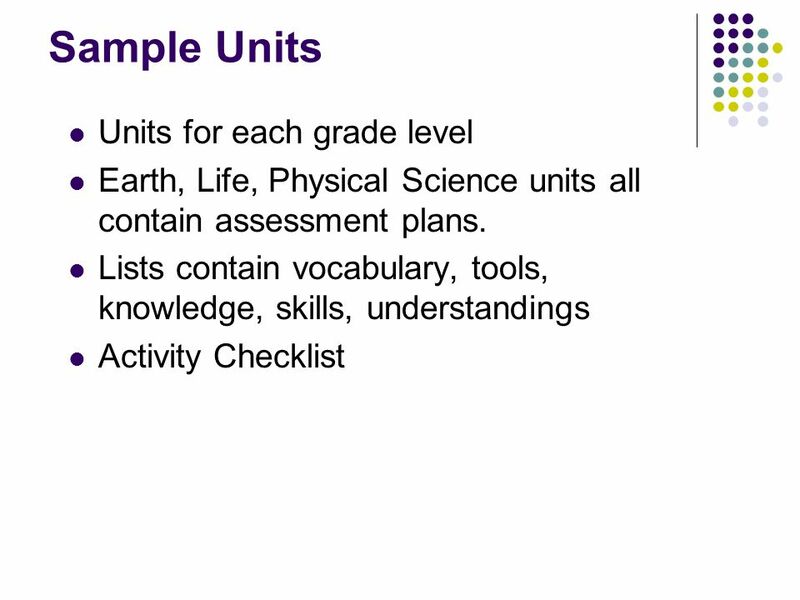 This includes assessment ideas and demonstrations of activities and timelines. 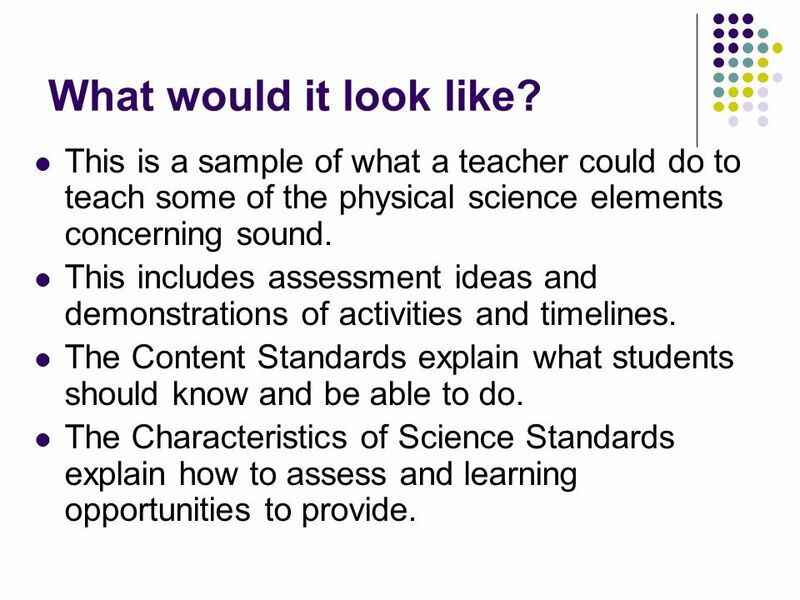 The Content Standards explain what students should know and be able to do. 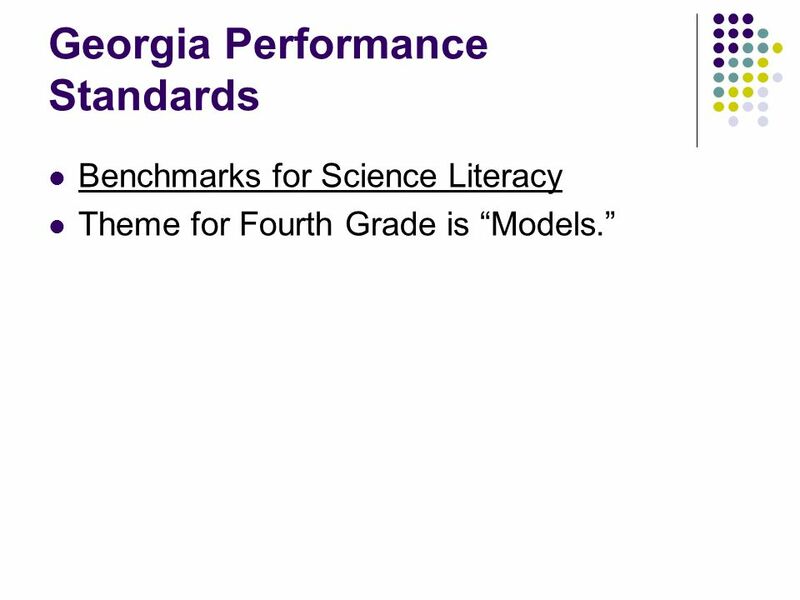 The Characteristics of Science Standards explain how to assess and learning opportunities to provide. S4P2. 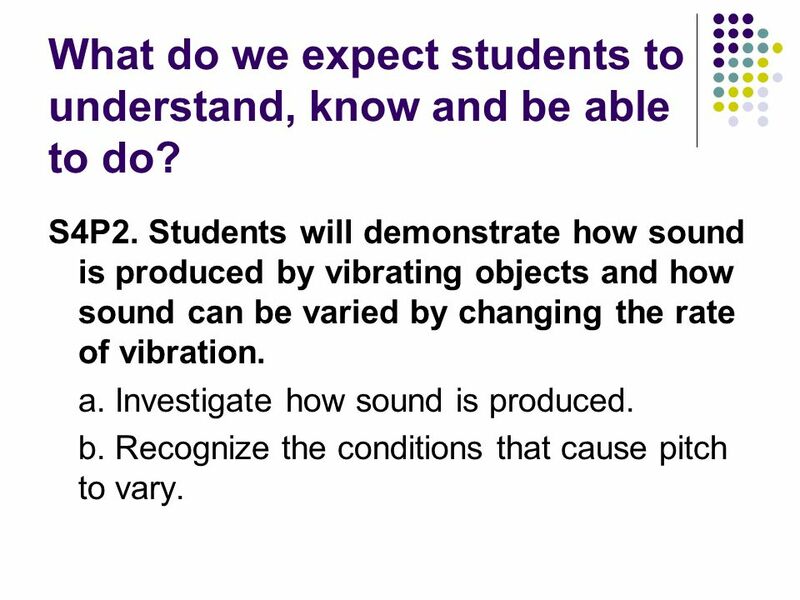 Students will demonstrate how sound is produced by vibrating objects and how sound can be varied by changing the rate of vibration. a. 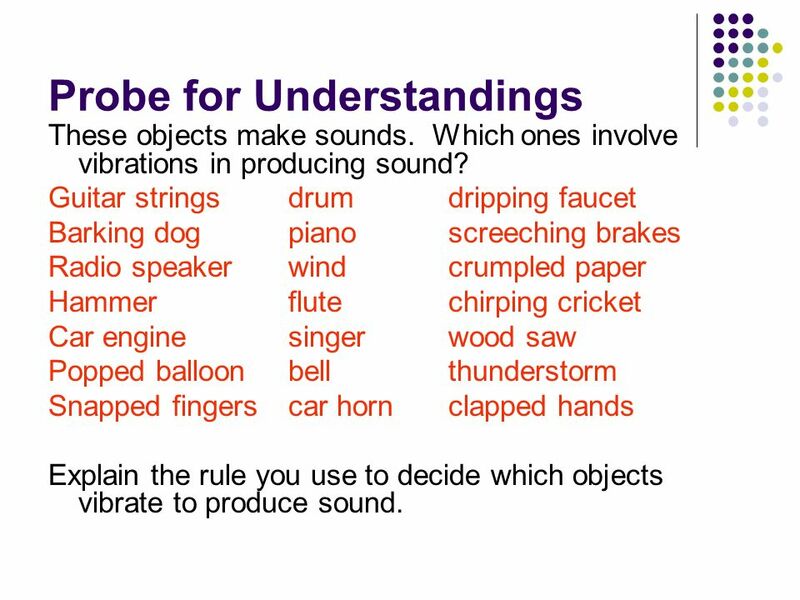 Investigate how sound is produced. b. Recognize the conditions that cause pitch to vary. 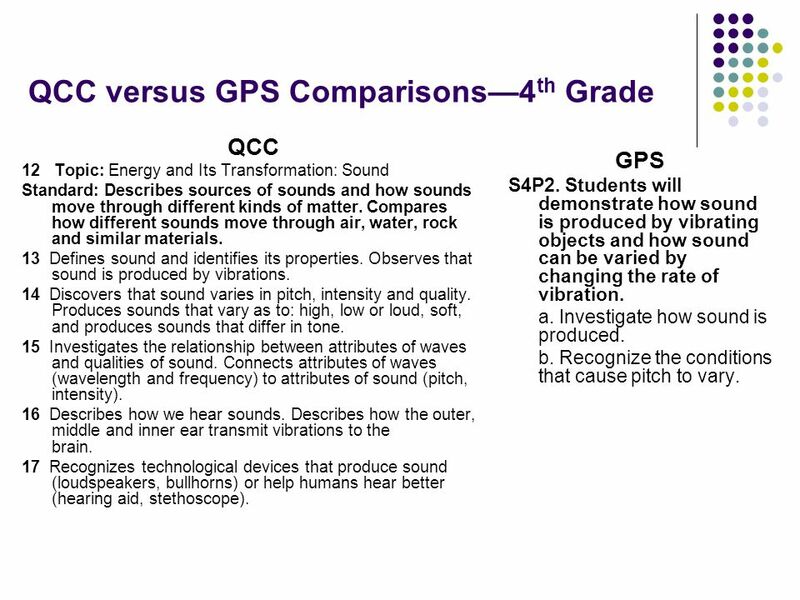 QCC 12 Topic: Energy and Its Transformation: Sound Standard: Describes sources of sounds and how sounds move through different kinds of matter. Compares how different sounds move through air, water, rock and similar materials. 13 Defines sound and identifies its properties. Observes that sound is produced by vibrations. 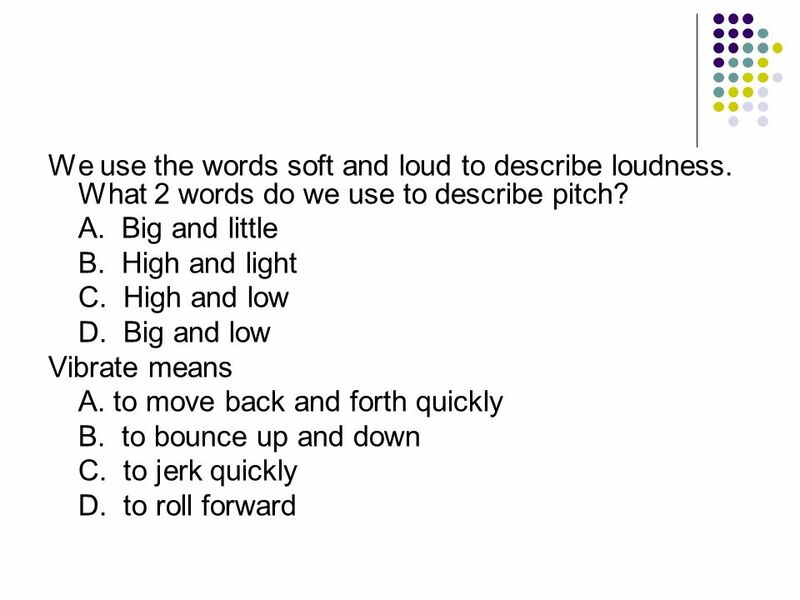 14 Discovers that sound varies in pitch, intensity and quality. Produces sounds that vary as to: high, low or loud, soft, and produces sounds that differ in tone. 15 Investigates the relationship between attributes of waves and qualities of sound. Connects attributes of waves (wavelength and frequency) to attributes of sound (pitch, intensity). 16 Describes how we hear sounds. Describes how the outer, middle and inner ear transmit vibrations to the brain. 17 Recognizes technological devices that produce sound (loudspeakers, bullhorns) or help humans hear better (hearing aid, stethoscope). 8 What do you mean? What do I change? What stays the same? 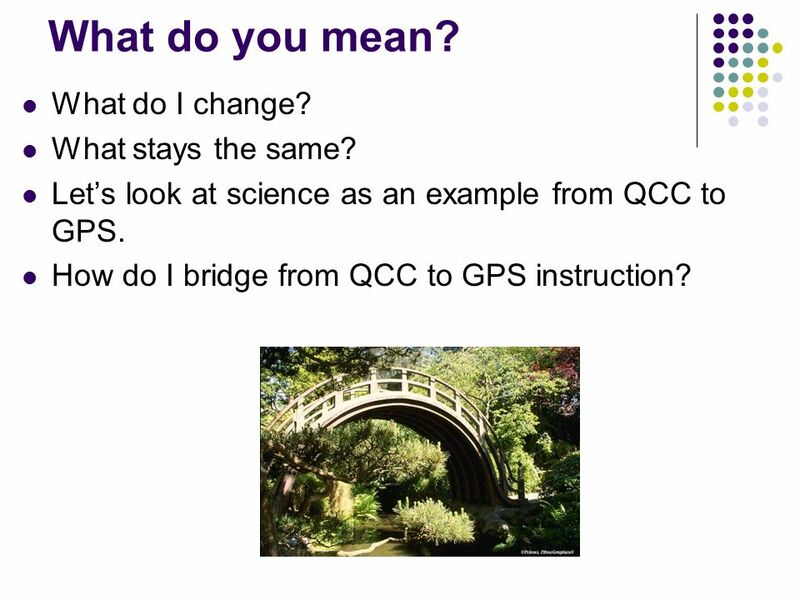 Let’s look at science as an example from QCC to GPS. How do I bridge from QCC to GPS instruction? 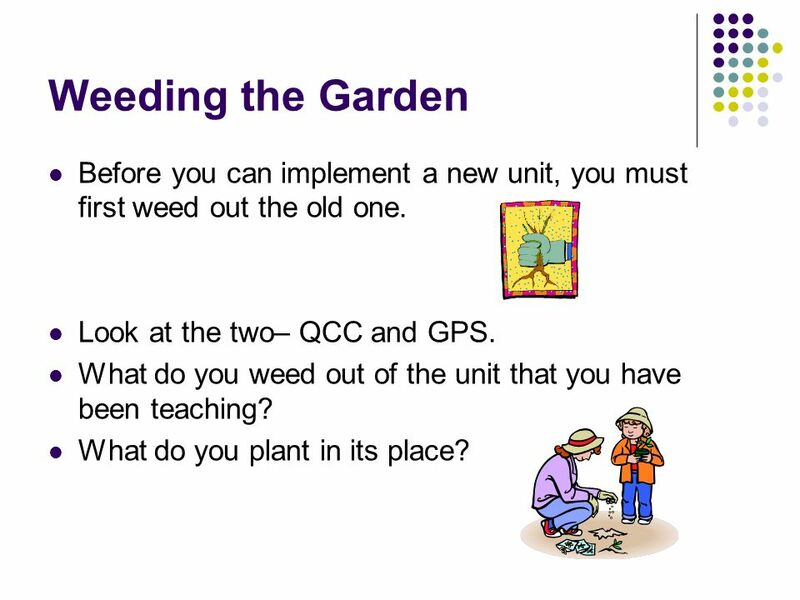 9 Weeding the Garden Before you can implement a new unit, you must first weed out the old one. Look at the two– QCC and GPS. What do you weed out of the unit that you have been teaching? What do you plant in its place? 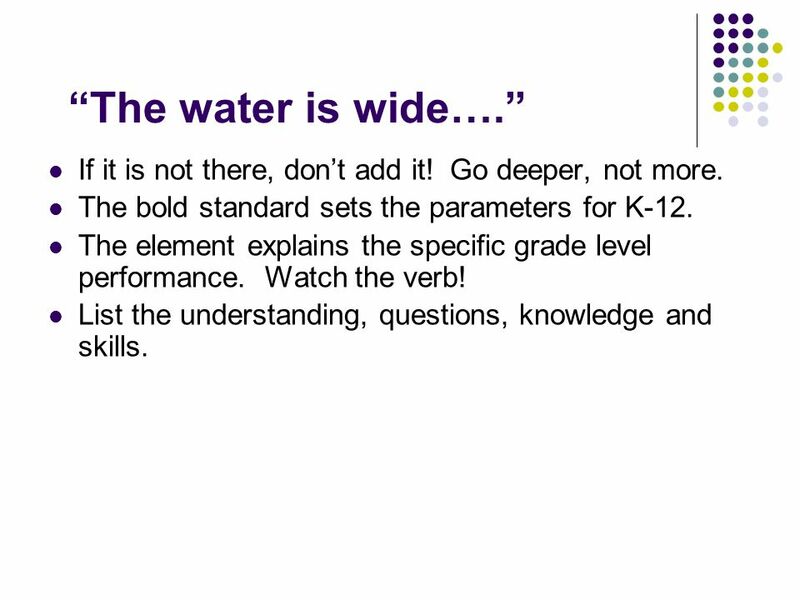 10 “The water is wide….” If it is not there, don’t add it! Go deeper, not more. 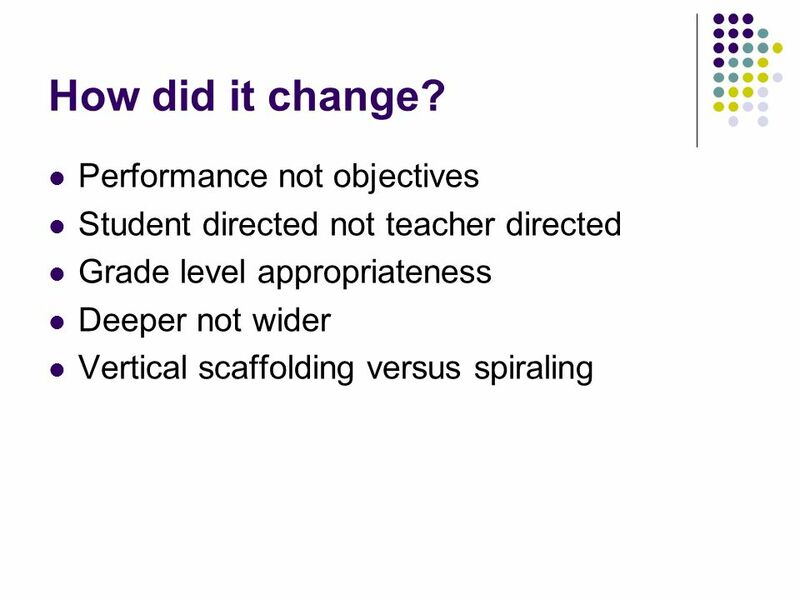 The bold standard sets the parameters for K-12. 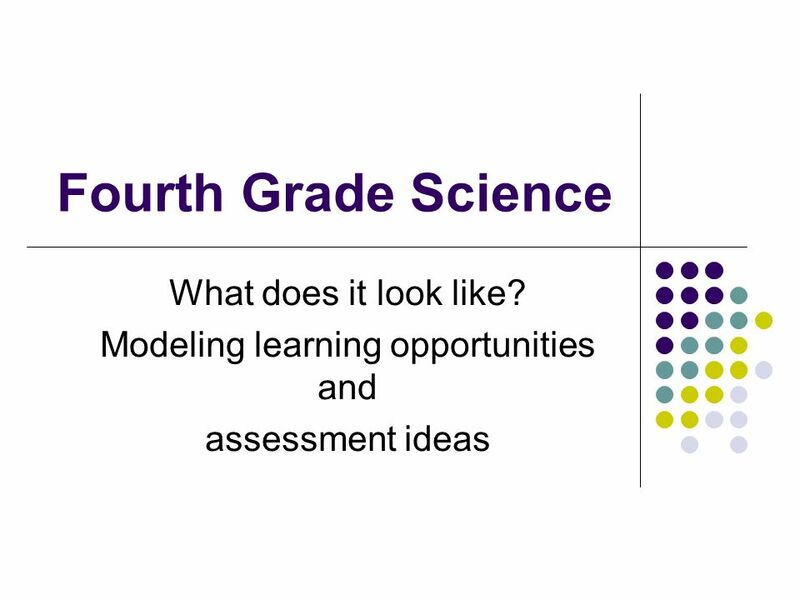 The element explains the specific grade level performance. Watch the verb! List the understanding, questions, knowledge and skills. 11 How do we know what to do? 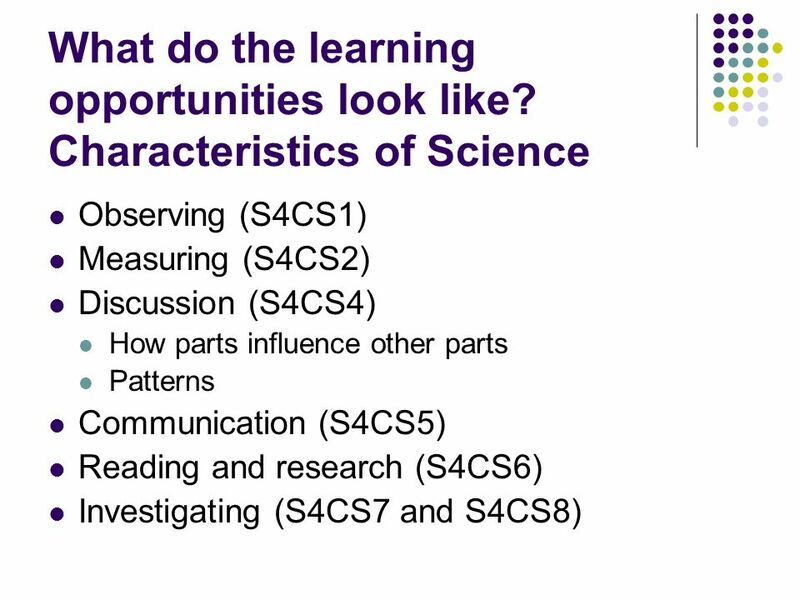 What learning opportunities do we use? 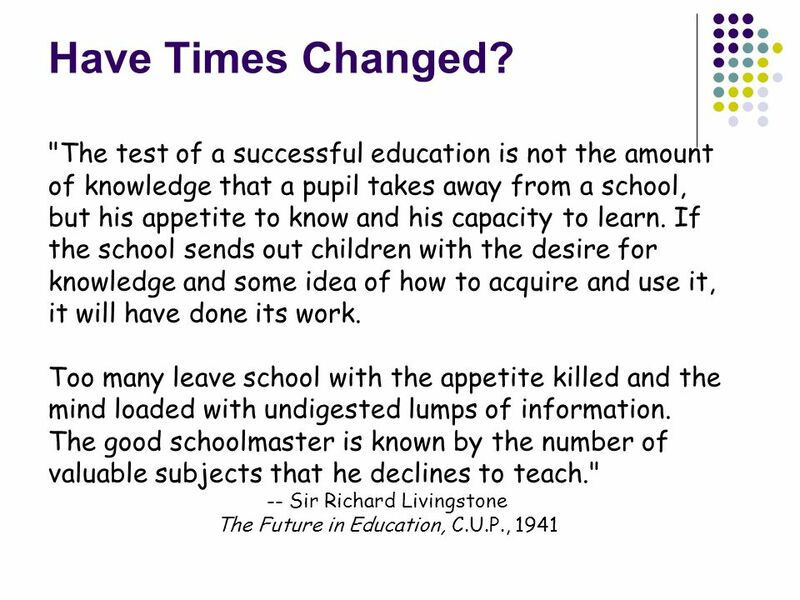 12 What do we expect students to understand, know and be able to do? S4P2. Students will demonstrate how sound is produced by vibrating objects and how sound can be varied by changing the rate of vibration. a. 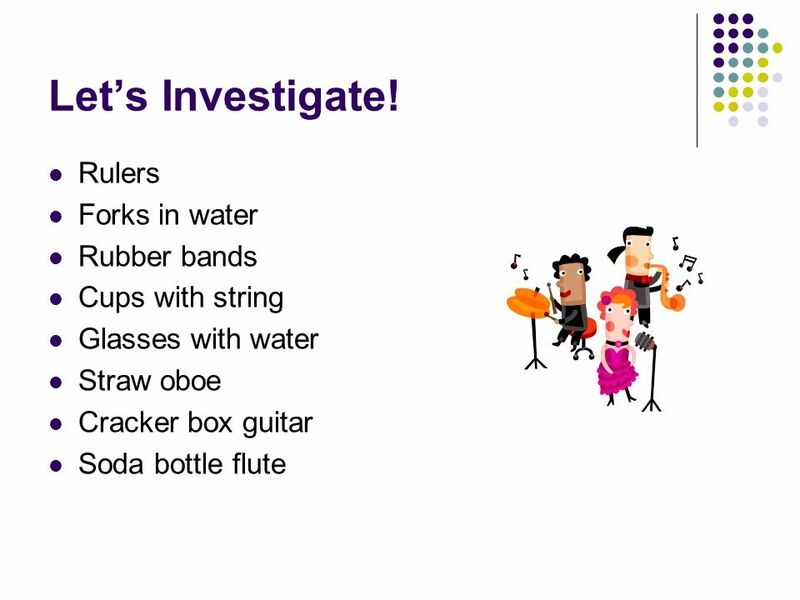 Investigate how sound is produced. b. Recognize the conditions that cause pitch to vary. 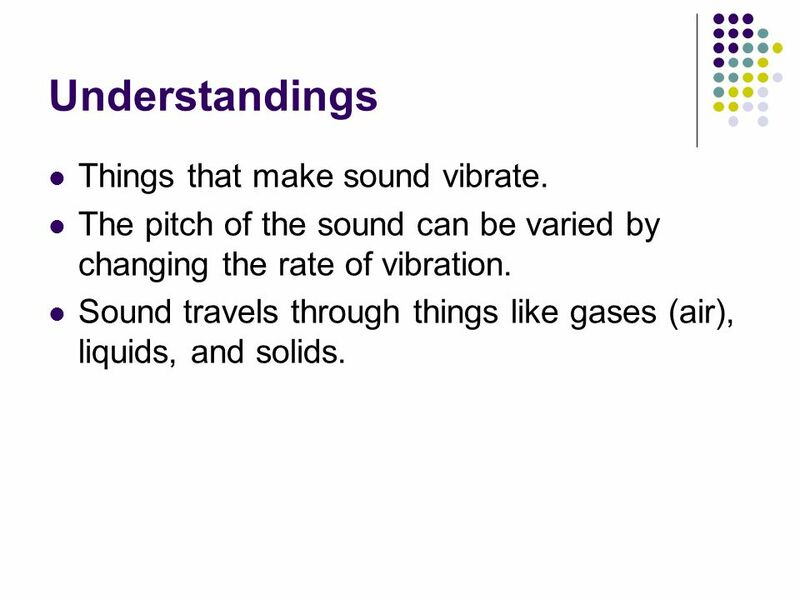 14 Understandings Things that make sound vibrate. The pitch of the sound can be varied by changing the rate of vibration. Sound travels through things like gases (air), liquids, and solids. These objects make sounds. 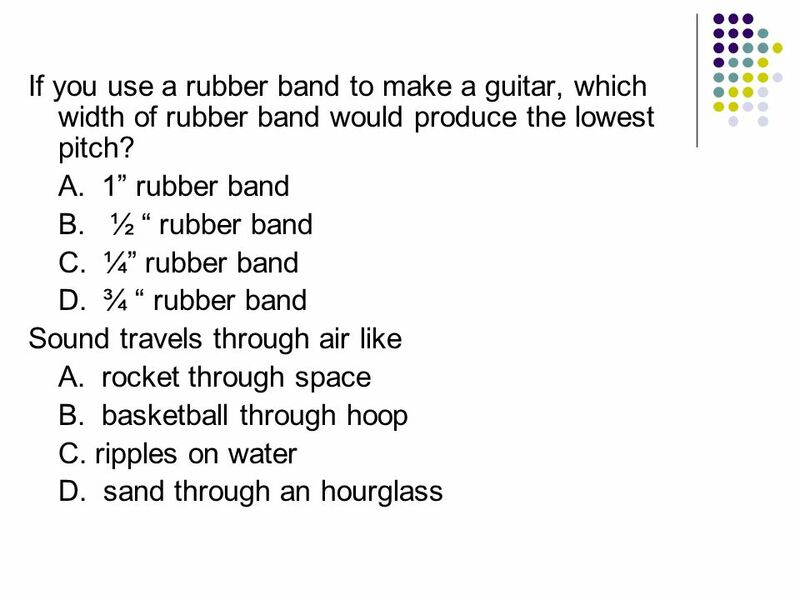 Which ones involve vibrations in producing sound? Guitar strings	drum	dripping faucet Barking dog	piano	screeching brakes Radio speaker	wind crumpled paper Hammer	flute	chirping cricket Car engine	singer	wood saw Popped balloon	bell	thunderstorm Snapped fingers	car horn	clapped hands Explain the rule you use to decide which objects vibrate to produce sound. 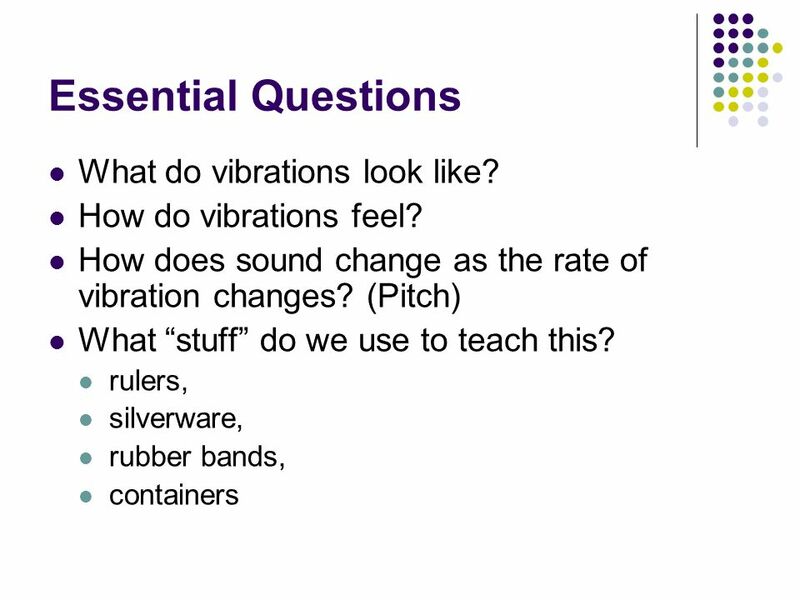 16 Essential Questions What do vibrations look like? 17 What’s on THE TEST? 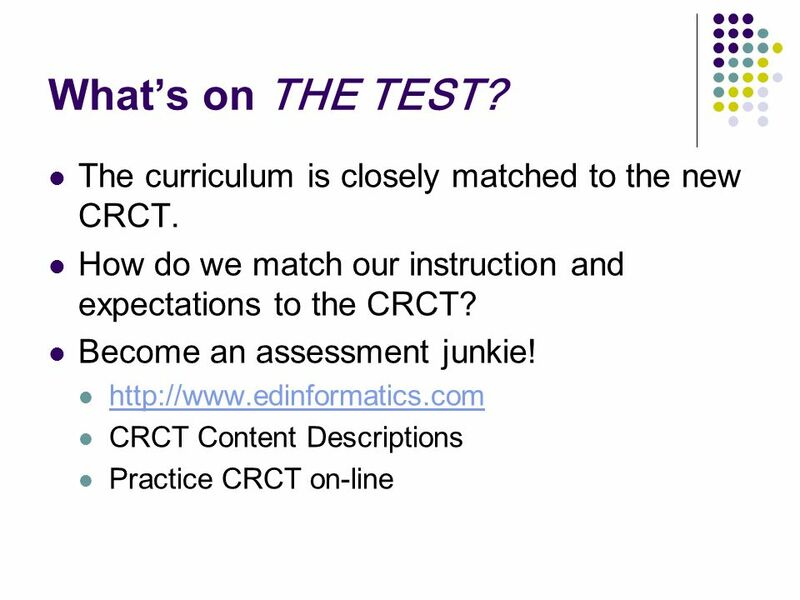 The curriculum is closely matched to the new CRCT. 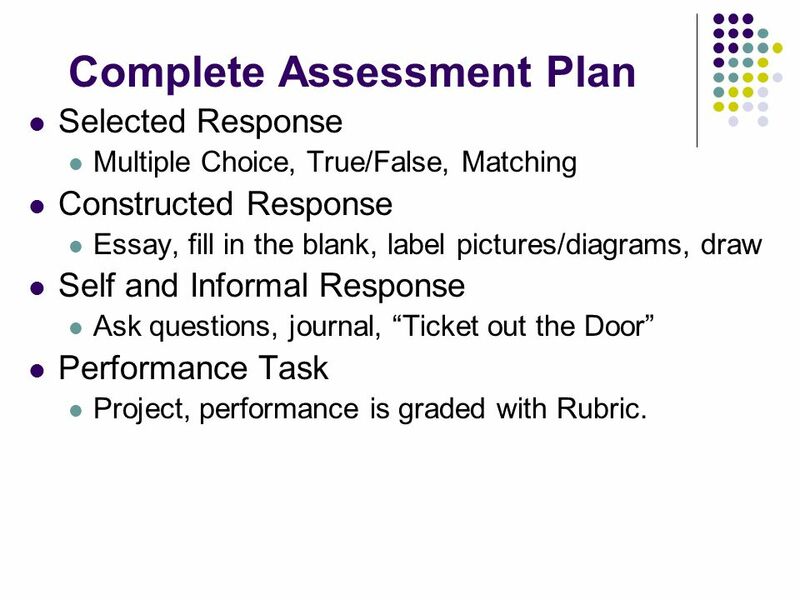 Selected Response Multiple Choice, True/False, Matching Constructed Response Essay, fill in the blank, label pictures/diagrams, draw Self and Informal Response Ask questions, journal, “Ticket out the Door” Performance Task Project, performance is graded with Rubric. 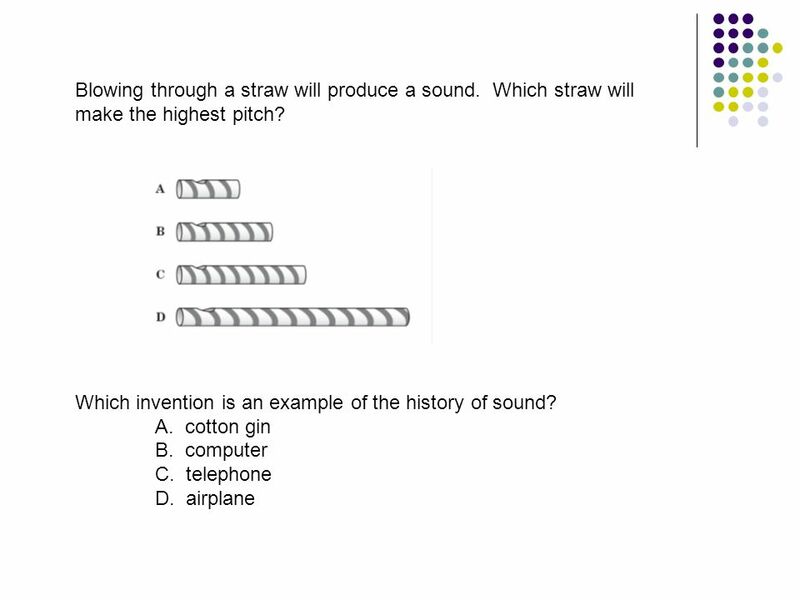 19 What would the test look like? 1. When you play a guitar, the sound you hear is caused by: A. Stretching the strings tightly. B. A wooden box that causes echoes. C. The round hole in the wooden box. D. The strings vibrating when plucked. 2. What we hear as pitch is caused by A. Reflection B. How far away the source of the sound is. C. The speed of sound. D. How fast the source of the sound is moving back and forth. 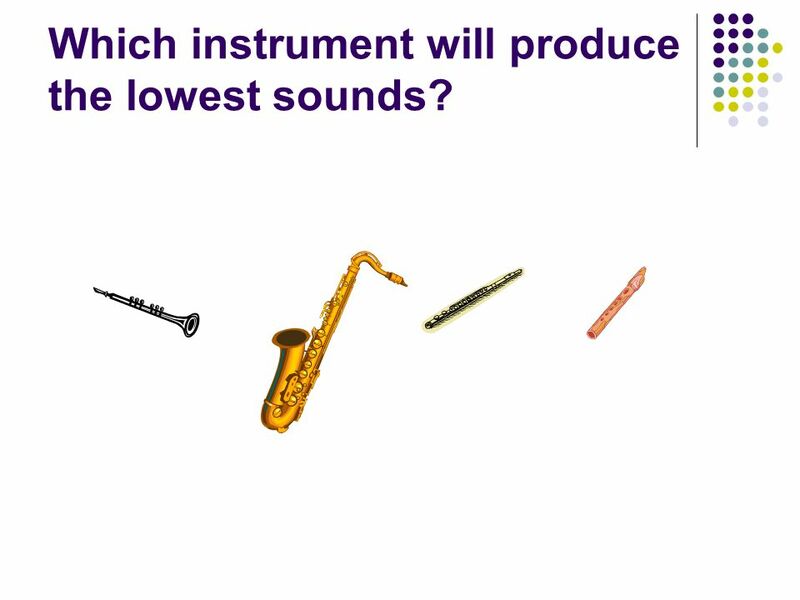 21 Which instrument will produce the lowest sounds? 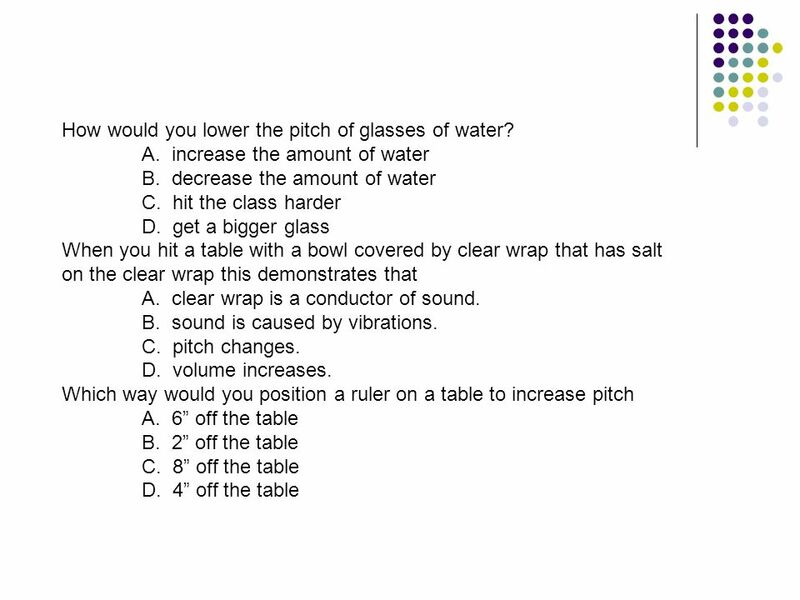 23 How would you lower the pitch of glasses of water? 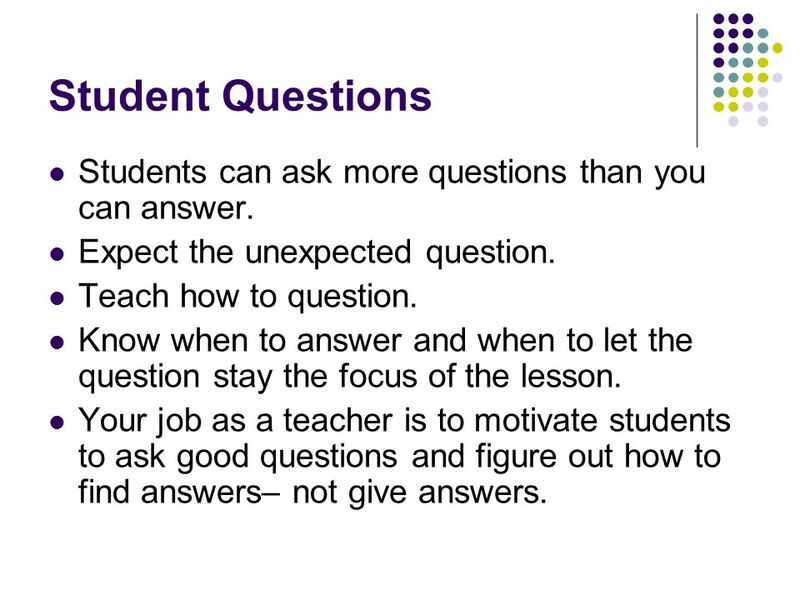 26 Student Questions Students can ask more questions than you can answer. Expect the unexpected question. Teach how to question. Know when to answer and when to let the question stay the focus of the lesson. Your job as a teacher is to motivate students to ask good questions and figure out how to find answers– not give answers. Stretch the elastic band from your teeth to your hand. Pluck at the band and listen for a sound. Tighten and loosen the band and hear how the sound changes. Do you feel the vibrations in your teeth? Your fingers? Can you see the elastic vibrate? 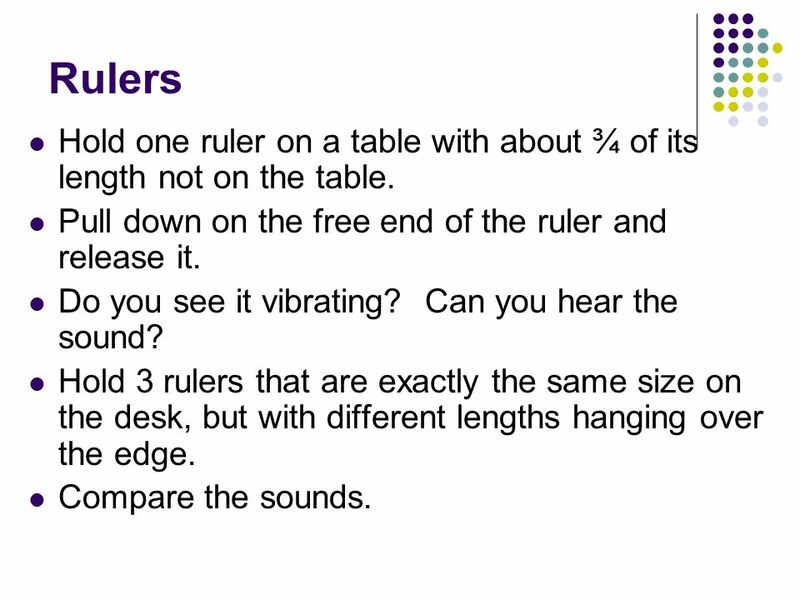 30 Rulers Hold one ruler on a table with about ¾ of its length not on the table. Pull down on the free end of the ruler and release it. Do you see it vibrating? Can you hear the sound? Hold 3 rulers that are exactly the same size on the desk, but with different lengths hanging over the edge. Compare the sounds. 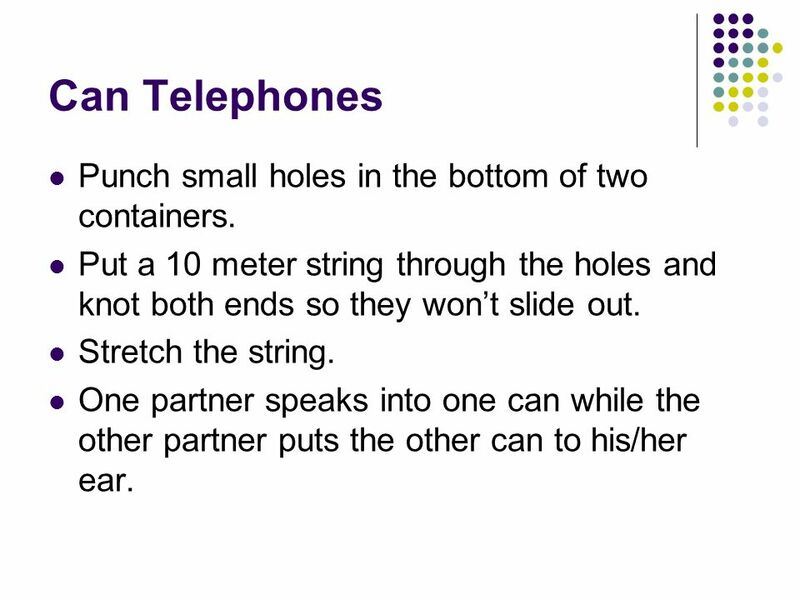 31 Can Telephones Punch small holes in the bottom of two containers. Put a 10 meter string through the holes and knot both ends so they won’t slide out. Stretch the string. One partner speaks into one can while the other partner puts the other can to his/her ear. 32 Voice Box Vibrations Carefully put your fingers on your throat. Do not apply pressure! Feel your throat when you talk. Vocal cords act like little vibrators. 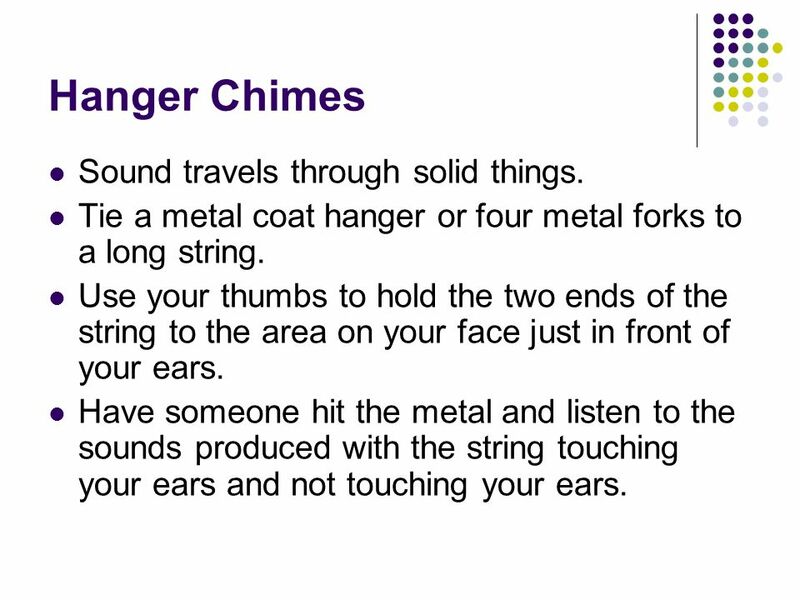 33 Hanger Chimes Sound travels through solid things. Tie a metal coat hanger or four metal forks to a long string. Use your thumbs to hold the two ends of the string to the area on your face just in front of your ears. Have someone hit the metal and listen to the sounds produced with the string touching your ears and not touching your ears. 34 Balloon Sounds Blow up a balloon. Squeeze the neck and slowly let the air leak out. Observe how the neck vibrates as the air escapes. 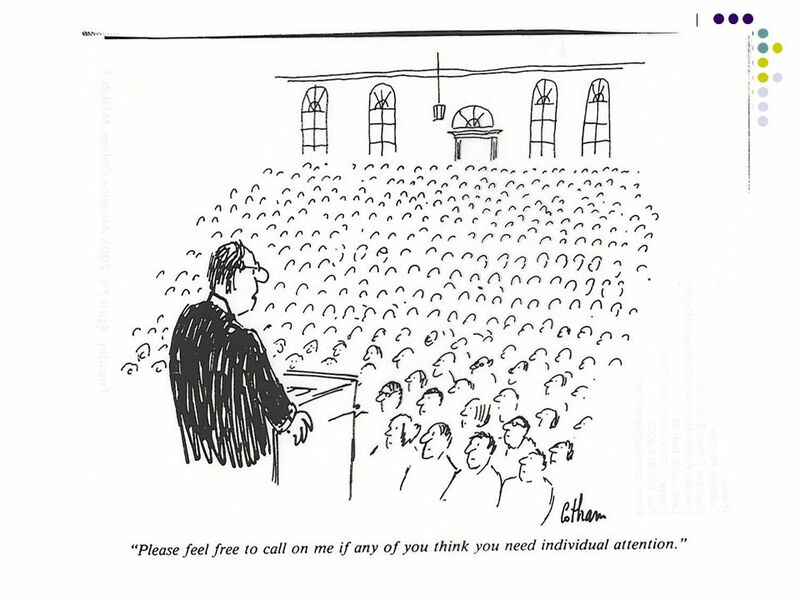 How can you vary the pitch? 35 Bloogles Cut the ends of a long corrugated tubing. 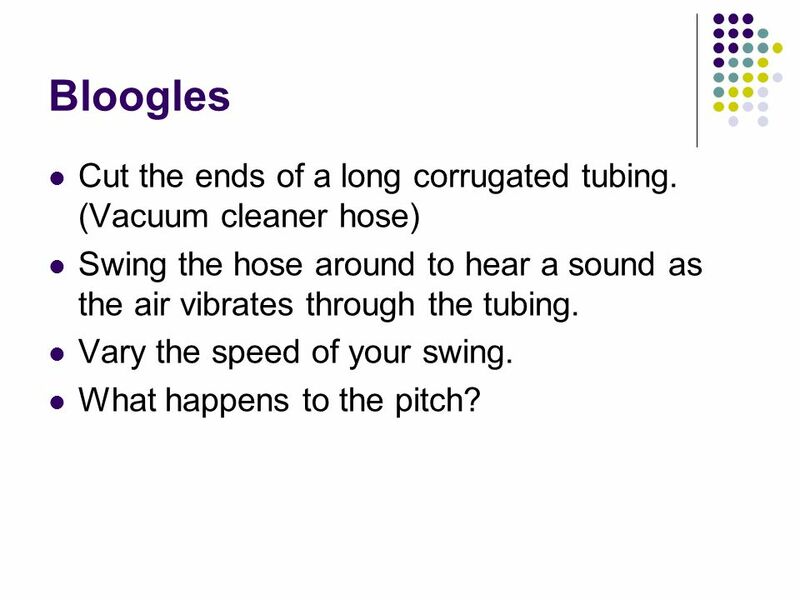 (Vacuum cleaner hose) Swing the hose around to hear a sound as the air vibrates through the tubing. Vary the speed of your swing. What happens to the pitch? 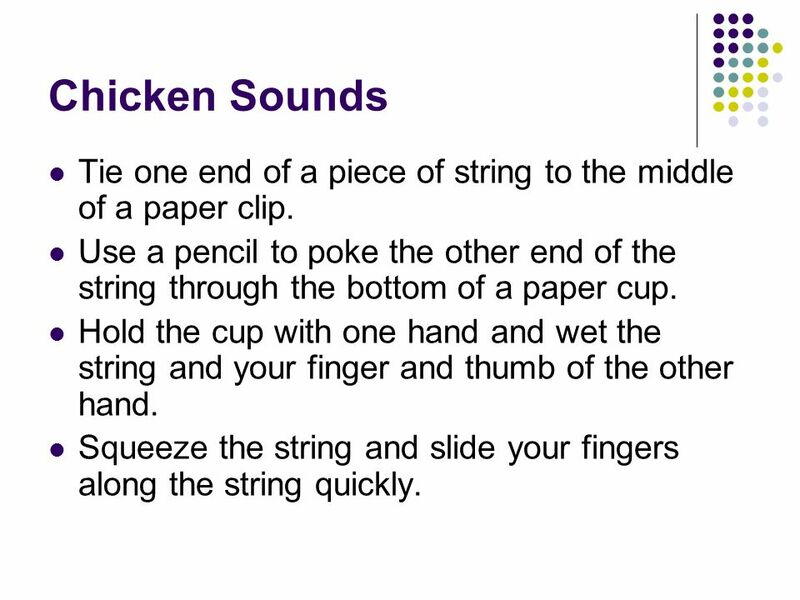 36 Chicken Sounds Tie one end of a piece of string to the middle of a paper clip. Use a pencil to poke the other end of the string through the bottom of a paper cup. Hold the cup with one hand and wet the string and your finger and thumb of the other hand. Squeeze the string and slide your fingers along the string quickly. 37 Straw Oboe Flatten the end of a plastic straw. Cut the corners off of the flattened end to make an inverted V. With practice, you can produce a sound by blowing into the straw. 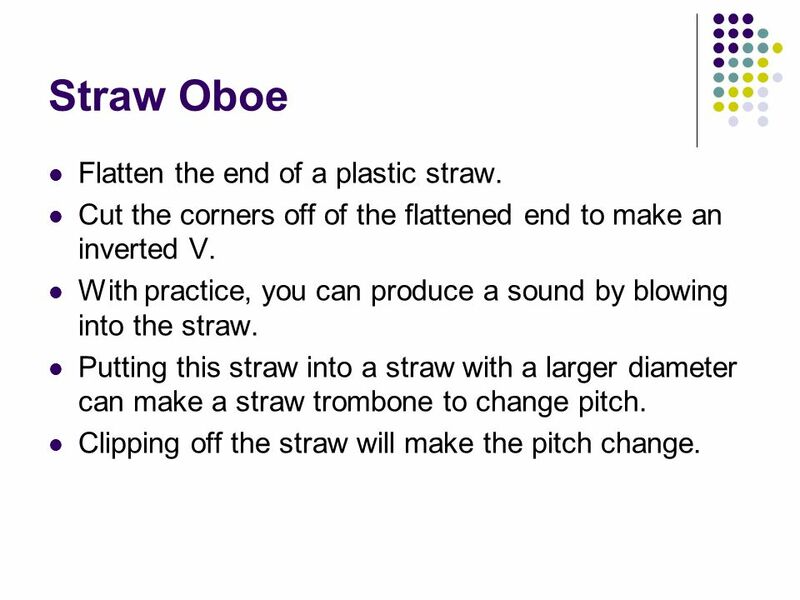 Putting this straw into a straw with a larger diameter can make a straw trombone to change pitch. Clipping off the straw will make the pitch change. 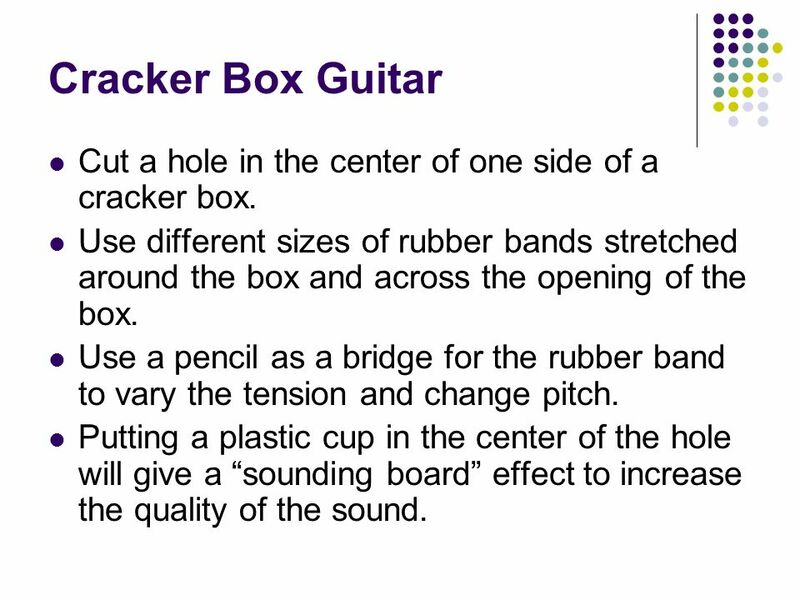 38 Cracker Box Guitar Cut a hole in the center of one side of a cracker box. Use different sizes of rubber bands stretched around the box and across the opening of the box. Use a pencil as a bridge for the rubber band to vary the tension and change pitch. Putting a plastic cup in the center of the hole will give a “sounding board” effect to increase the quality of the sound. Use same sized bottles or glasses filled with different amounts of water. Hitting the sides of the glass will cause a sound as the water and glass vibrate. 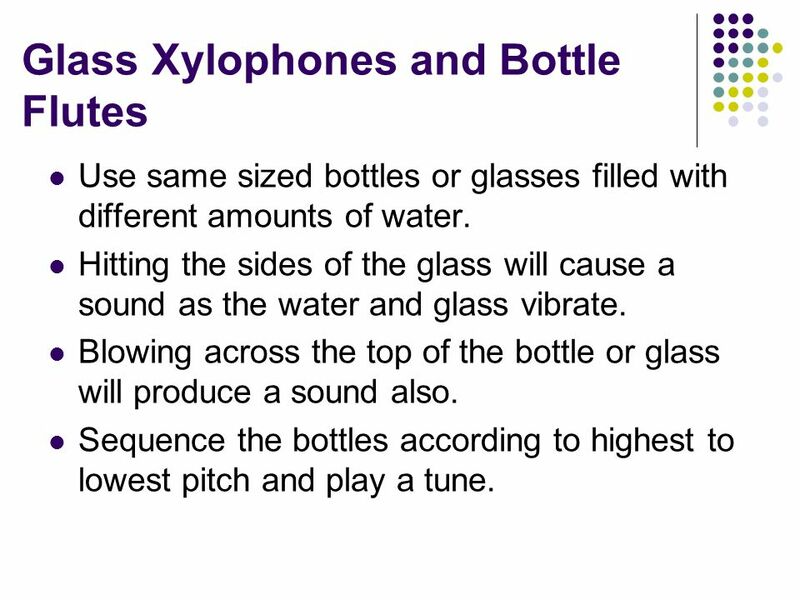 Blowing across the top of the bottle or glass will produce a sound also. Sequence the bottles according to highest to lowest pitch and play a tune. 40 Finding the Time Look for connections. If it is in a different subject, just recognize the integration. 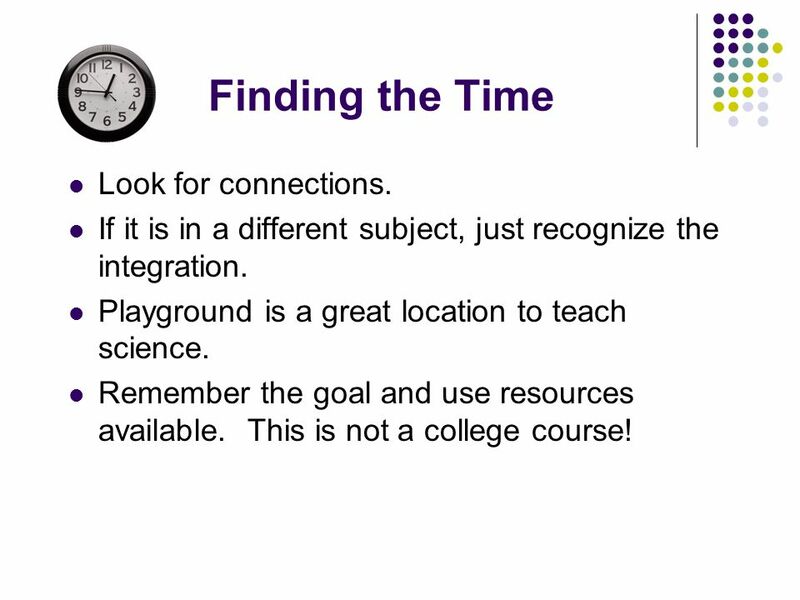 Playground is a great location to teach science. 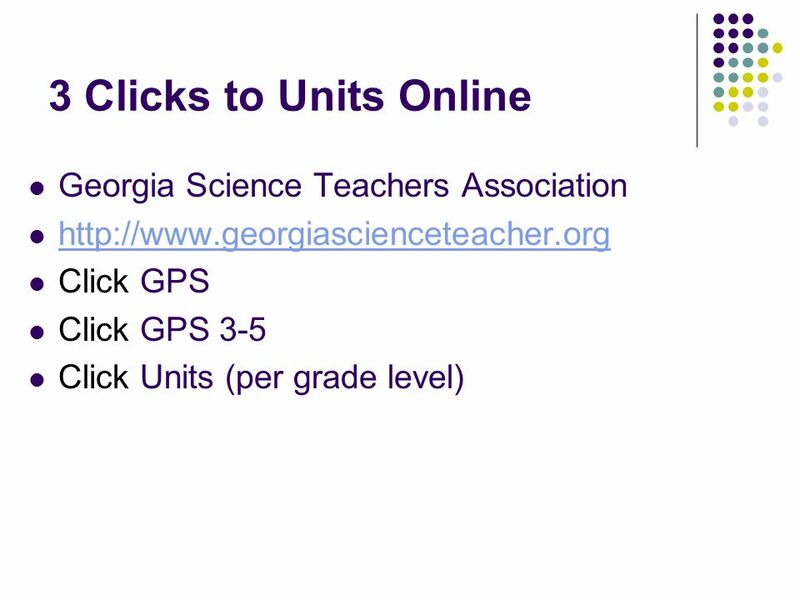 Remember the goal and use resources available. This is not a college course! 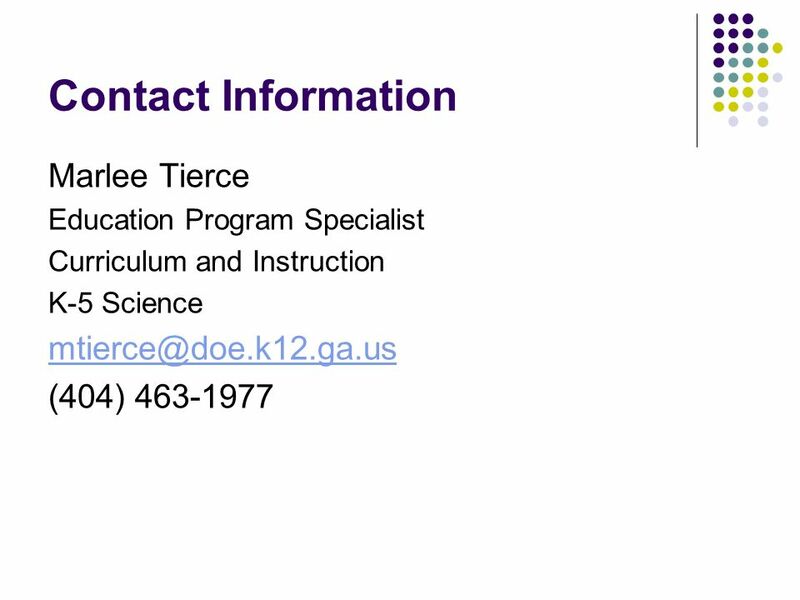 Download ppt "Modeling learning opportunities and"
Hearing Sound by Denise Carroll. 2 days (max) Day 1 Day 2. Good Vibrations Monday March 26 th, 2012 Warm-up: (1) Draw a tuning fork on your paper. (2) Using prior knowledge, describe. Sounds through Air and Water. Student sheet no. 13 called Sounds through the Air Student sheet no. 14 called Sounds through Water Tone generator with. 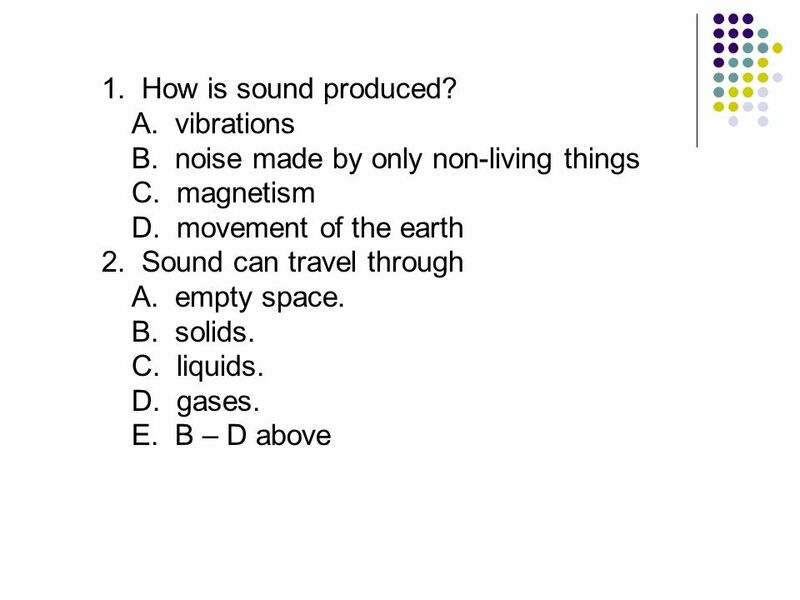 Sound Test Review Vibrations Back and forth movements of matter are called. Sounds are form of energy, created by something vibrating (moving very fast in invisible waves). The vibrations set up sound waves in the surrounding. 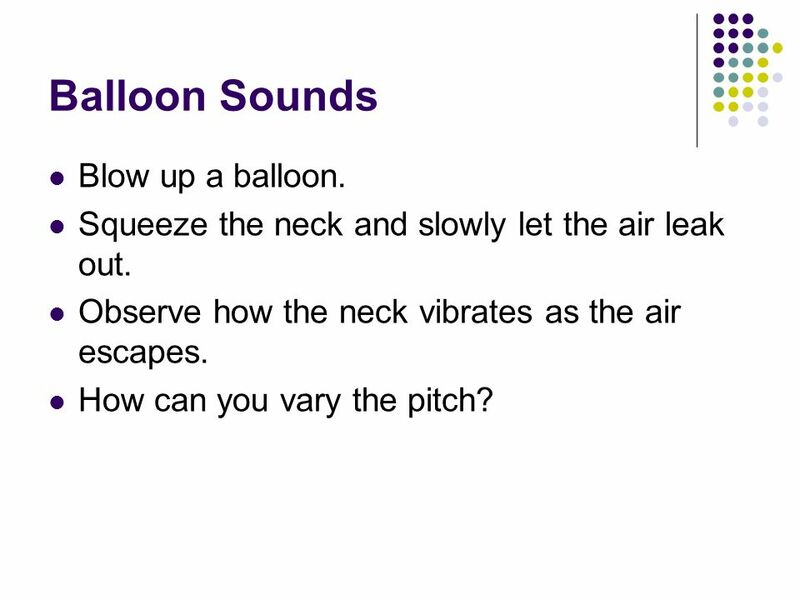 Sound Lesson Standard: Standard 3-5: The student will demonstrate an understanding of how motion and sound are affected by a push or pull on an. 1. Place 5 marbles along the groove in the ruler as shown on your handout. 2. Now take a 6 th marble and flick it against the end of the row. 3. Draw. 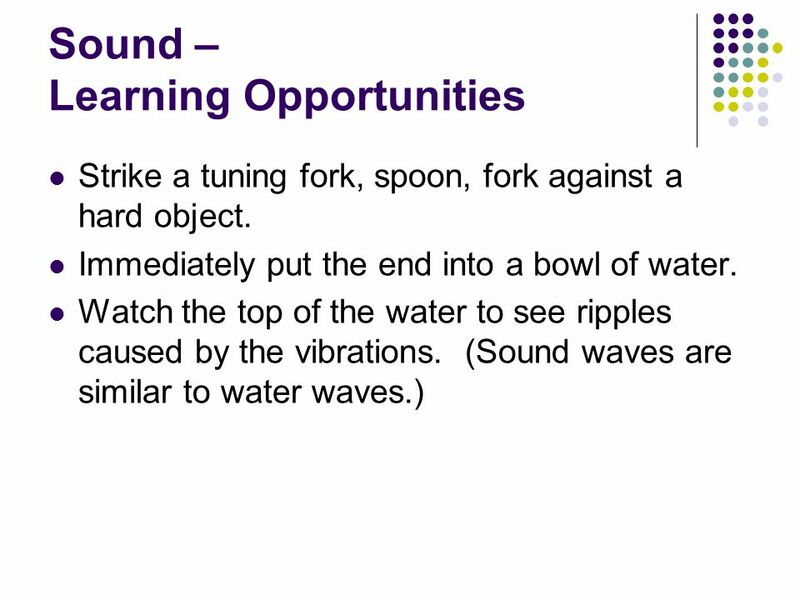 Book O - Waves Unit 3: Energy On the Move 11.1: The Nature of Sound 11. Sound demostrations Sound wave are caused by vibrations and carry energy through a medium. ESCI 215 Chapter 8. Discovering Sound Waves 500 BC a Greek philosopher Pythagoras Length of strings of musical instruments affects the quality of sound.